Your new acquisitions should keep you out of trouble for a while. I�ve been wondering how your locomotive project was coming along. Welcome back Bob! Although you never really been away:-) Love the purchases, the EM locomotive is great looking. The running characteristics are hit and miss. 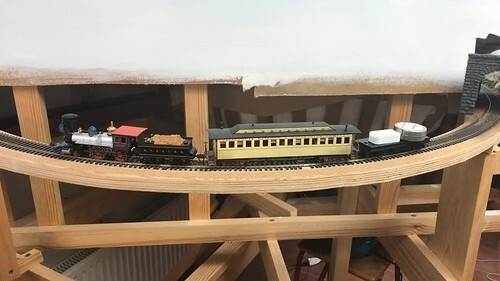 I have a EM H3 2-8-0 that runs great with the original gearbox but my H1 took a lot of work and it still hesitates a little on every rotation running tender first. I hope yours run great as it is. The cars look great, they may be heavy and a way to reduce the weight is to change the trucks to plastic or 3D printed ones. 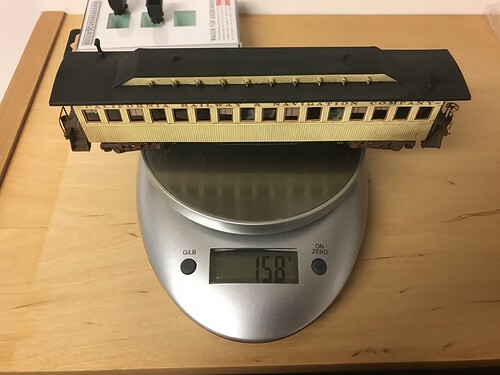 I�ll make a test and try a Bachmann new tooling 4-4-0 and how many cars it can pull on my 2% grades so you have some kind of reference. The hopper looks very nice, great find. Thanks for sharing. Thanks Andre, Mike and H�kan. Yes, The last self just got hung and I'm letting the blood run back into my hands now. 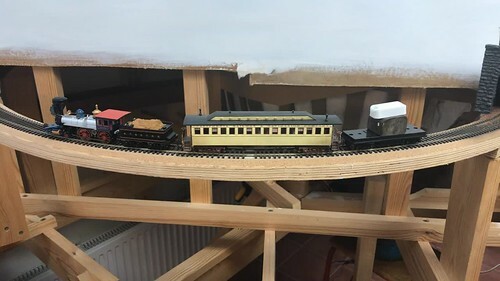 A quick not on the hoppers I showed; Yahoo groups early rail is now at; EarlyRail@groups.io <digestnoreply@groups.io> On that site Bob McGlone has been discussing detailing and assembling these prints into finished Models. I swear I just found it this morning. H�kan, Your experience parallels what I have heard from others concerning EM products. But, I think I can handle it. It should be easier then getting my Key (I think) 2-6-6-2 Samson running. I really appreciate your feedback of the brass passenger cars and look forward to hearing your test result. That will be a great help. Ooh! I have one of those H-1 brass models in a box somewhere. I'll be -very interested- to see what you do with it! Sounds good Dave, be patience though. I got to finish the Moguls first. Otherwise it won't have anything to push. I built a bench for what's in the mystery box. to support all 143 lbs of it. So can you guess what's in the box yet? Both of these pictures were heavily adjusted with Gimp 2 so that you can hopefully benifit from them. Is it a major award from Italy? Oh that's a great base for a wine vat so you can STOMP your grapes. I'll drink to that. Andre, close, you missed the point of organ a mere 7562 km. Not Bad. One more Ebay win to share. I got this for a good price (that's under 300.00 for me) because it didn't have a box and need a little work. I bought this about 3 weeks ago but just got it Monday because the seller proved his humanity and sent it to South Bend Ohio.He sent me a United model of UP 119. So an exchange had to be made. But all is right now. Neat little engine. Wm. Crooks? My joke: You have to be familiar with the movie "Christmas Story" before it makes sense. I've been tempted to pick up some brass... but I stumble at the prices. Getting too stingy in my old age! Nice purchase. Looks like the seller threw in an extra dome. thank you, It is a Wm. 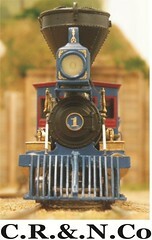 Crooks, a New Jersey Locomotive build of 1861, as built with two steam domes Mike. I have tested the Bachmann new tooling 4-4-0 on my 2% grades. I judged it to be able to pull 2-3 brass cars up the grade. 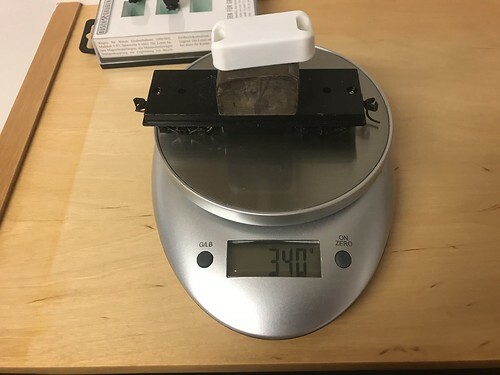 I started by weighing in my brass GEM coach at 158 grams. I then added another car weighing in at 340 grams behind it. I then reduced the weight on the second car to 163 grams to a total of 321 grams. That it could pull up the grade without problem. An estimate is that the loco can pull safely without wheel slippage approx. 300-400 grams up the 2 % grades. My non-scientific test didn't take into account the wheel drag from a third car though. The GEM car rides on 3D printed free rolling trucks so the weight is reduced compared to the original car. I hope this can be of help. H�kan, thanks, that's very helpful. Very useful. Bob, looks like a perfect spot for a helper locomotive. I'm going to guess the new acquisition has something to do with Light Amplification and the Stimulated Emission of Radiation, yes? I see you painting the framing white. I am considering doing the same with my upcoming benchwork for the same reasons. Whereabouts in California are you?